Our cumulative project at PAFA's Summer Art Camp "Monster Mash" week was a Monster Dinner Party. 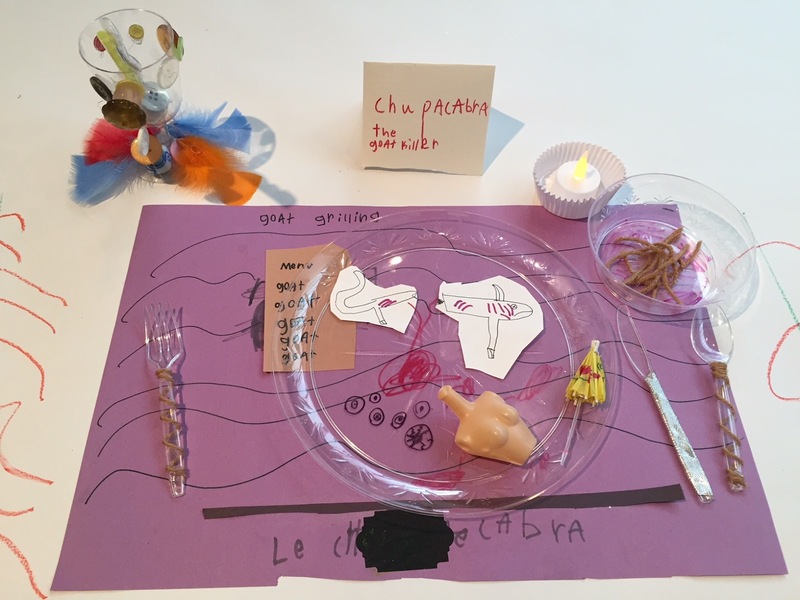 Our party was of course inspired by Judy Chicago's "The Dinner Party", which hopefully these 8 and 9 year olds will see someday when they're in Brooklyn. Made in response to the absence of women in celebrated history, her "epically feminist installation" sets a dinner party for 39 mythical and historic women. Our party on the other hand, celebrated nine mythical and magical beings, including a vampire, a snow dragon, the Phoenix, Nessie, a mermaid, and other friends. (Don't worry, we were of course careful about which monsters we sat next to each other, to avoid conflict). I was pretty stoked to see a lot of powerful female "monsters" get the invite to this party. 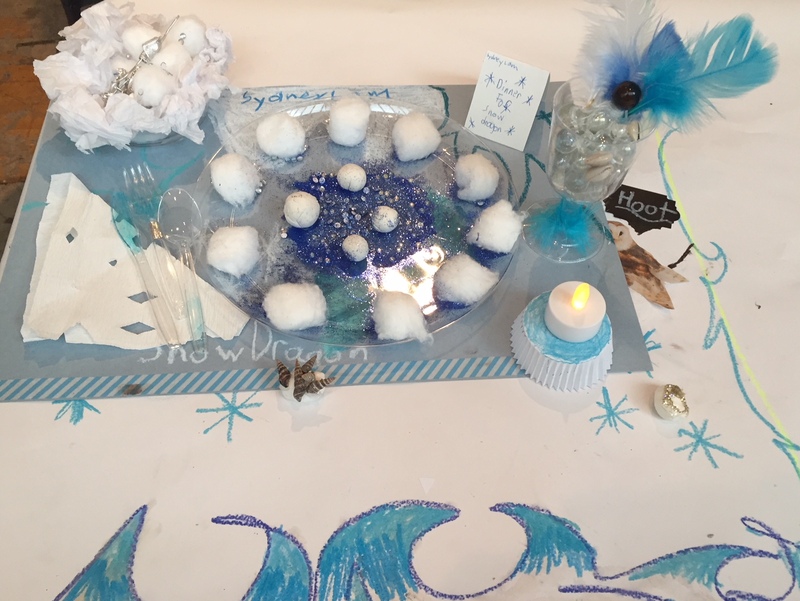 Informed by their research, they were encouraged to think about what colors, designs, and artifacts to include in their table dressing. Aquatic monsters (like Nessie and a mermaid) tended toward cool color schemes and inclusions of seashells. Lava Monster and our Phoenix on the other hand celebrated those hot colors! Some monsters got personalized menus to satiate their particular cravings: Rock Spaghetti, anyone? 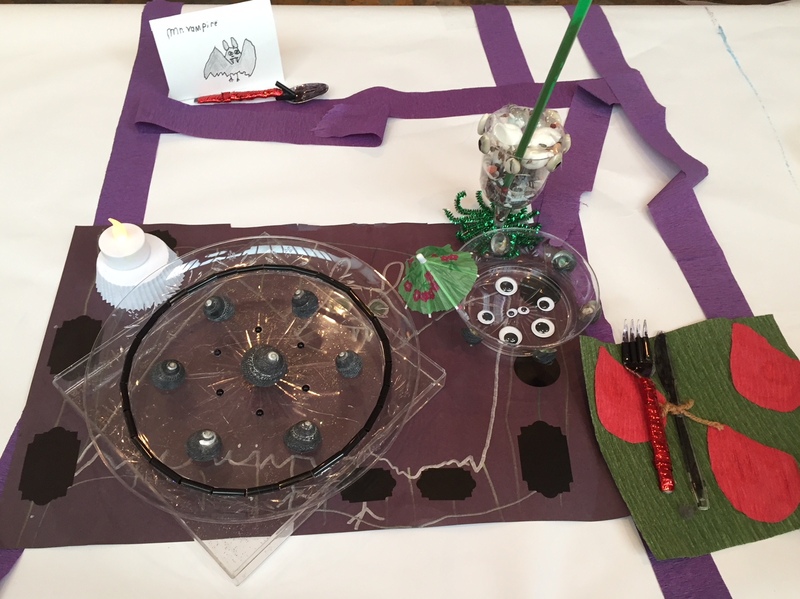 The artists were encouraged to add detail at every turn and ultimately created personalized tablecloths, runners, place mats, flatware, vessels, and plates for their creatures, making for a true celebration of individuality.